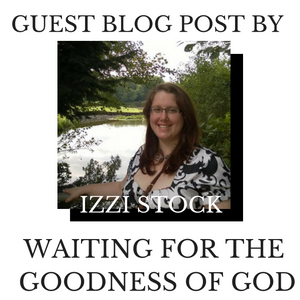 I am pleased to announce the start of a brand new blog series called “Testimonies of God’s Goodness”. The series is inspired by my book “Testimonies of a Good God” and the idea is to get people sharing their stories of God’s goodness in their lives. 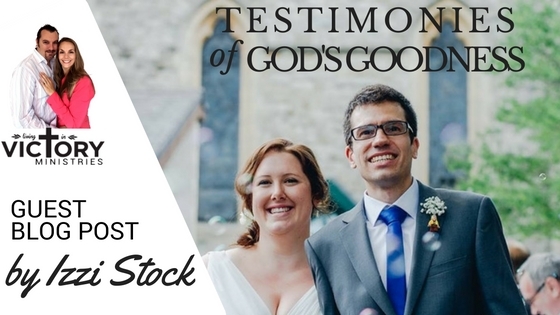 This week’s story is from a good friend Izzi Stock. She is an amazing lady and has such a great testimony of God’s goodness and faithfulness. I know you are going to be blessed by it. Ps- Be in touch if you have a testimony of God’s goodness that you want to share, I would love more people to be a part of this series. I was 11 years old when I prayed a prayer. Mrs Williamson, our P7 teacher, was giving us the before-high-school chat. I don’t remember the full conversation but one thing she said stuck out: the boy who was her first kiss was the man she ended up marrying. At that moment I prayed a heart-prayer that my first kiss would become my husband. Fast-forward 19 years: no ‘I do’ and certainly no first kisses. There was, however, confusion over the goodness of God. I had known God personally since I was at least 6 years old, had prayed countless prayers and stepped out on countless acts of faith. I had many answers to prayer, including miraculous provision and divine encounters, any of which could speak to God’s goodness. Yet honestly I was not certain if he truly cared or truly wanted to answer the heart-prayers, those deep cries that lay your soul bare. I had staked a whole lot on each of those prayer. Some had been continuations of my prayer aged 11, others had been around other life circumstance. Some had been born out of faith from the provision I had seen, others had been desperate cries at difficult times; none had been easy to pray. The Bible says, “The LORD is good to those who wait for him,” (Lamentations 3:25). I was still waiting and the waiting was hurting me deeply. Sitting in The Meadows in Edinburgh, a friend asked me out. Finally, an opportunity for my first-ever kiss. I was almost ready to give up on that childhood prayer, exchanging it for a short-term relationship that I knew would not last, in order to feel wanted by someone. I told myself God would understand, no prayer prayed as a child could be taken seriously in these circumstances… And yet I said no. Not through any act of great faith in God’s goodness or blinding light from heaven, but simply resigning myself to seeing through what I had started. Three months later, I kissed a guy. A guy who I hadn’t known that day in Edinburgh. Just under two years after that, my first kiss became my husband. On the 25th July 2015, 21 years after I had first entrusted that heart-cry to him, I could finally say that I had waited upon the LORD and he was good! Looking back now, I can see some of the reasons for God’s timing in this circumstance – not least that kissing a boy living at that time in South Africa would have been quite hard for an 11-year-old girl in Scotland! However, I have other heart-prayers that have not been resolved, and perhaps harder to come to terms with, others have had very different resolutions than I was longing for. I don’t have answers to these, or to the seemingly un-answered heart-cries of others I know about. Don’t forget to download your 4 free chapters of Byron’s book now.